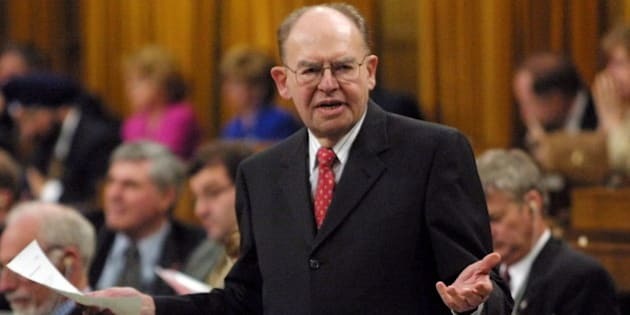 OTTAWA - Herb Gray, a Liberal fixture on Parliament Hill whose four decades in the House of Commons made him one of Canada's longest-serving parliamentarians, won't be getting a state funeral, the Prime Minister's Office says. Spokesman Jason MacDonald confirmed Tuesday that while the government is offering to help family members in making funeral arrangements, a state funeral is not on the table. Gray was a "great Canadian and a tremendous parliamentarian who served with honour and dignity," MacDonald said. "I can confirm that we are providing the family with support but it will not be a state funeral." Word of the decision followed a day of speculation and lobbying, on social media platforms and elsewhere, as political veterans both past and present spent the day remembering the veteran MP and cabinet minister. Former prime minister Paul Martin was among those arguing Tuesday that Gray, who died Monday at the age of 82, deserved the best possible sendoff. "I just think that Herb Gray's contribution to this country is so important, and that it should be recognized in absolutely the best way possible," Martin said in an interview. "Herb Gray deserves it. I also think the country deserves that one of its great parliamentarians be honoured in that way." State funerals, such as the elaborate ceremony that transpired last week for former finance minister Jim Flaherty, are typically only offered to the families of sitting and former prime ministers and governors general, as well as sitting cabinet ministers. Exceptions, such as that for Flaherty and former NDP leader Jack Layton in 2011, are at the discretion of the prime minister — and rare. One official, speaking on condition of anonymity because he wasn't authorized to discuss the matter publicly, noted that Flaherty and Layton were both sitting MPs when they died. Flaherty had resigned as finance minister only three weeks before his death, said the official, who likened Gray's circumstances with those of Martial Asselin, a former MP, senator and Quebec lieutenant-governor. Like Gray, Asselin was granted the right to use the honorific "The Right Honourable," a title usually reserved for the prime minister, the Governor General and the chief justice of the Supreme Court of Canada. Perhaps predictably, coming as it did on the heels of Flaherty's funeral, Gray's death touched off a flurry of activity on Twitter, where a chorus of voices called on the government to grant Gray's family the same honour. "If Herb Gray doesn't deserve a state funeral, no one does," law student James Bowie tweeted. "I don’t see how the prime minister, having given Jim Flaherty a state funeral, can now deny one to Herb Gray," added Keith Torrie. With the exception of the Peace Tower, flags on all federal buildings in Ottawa were flying at half-mast Tuesday, and will remain there until sunset on the day of Gray's funeral or memorial service. On that day, the Peace Tower flag is to be lowered to half-mast from sunrise to sunset. In Tuesday's interview, Martin recalled how had it not been for a pep-talk of sorts from Gray, he might not have stuck with his university studies in his earlier years. "I was in first-year law, and was thinking of dropping out," he recalled. But his father asked him to speak with a friend who was also a lawyer — Gray. "And we sat down for two hours and he told me what law was all about and why I should stay in law school," said Martin. "And we formed a friendship, and it's one that lasted a long time."